Although new Omaha players may have a ton of enthusiasm for the game, you still have to learn the ropes before you'll become a winning player. If it's your first time playing Omaha poker, you're likely to make the same mistakes as other beginners. That's why we wrote this article - to help new players overcome the common issues they face in Omaha poker. 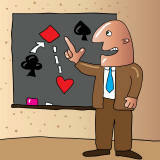 Keep reading to discover the five most common Omaha poker mistakes for beginners. Most Omaha players start out playing Texas Hold'em and try to bring their No Limit Hold'em strategy to the table when they start playing Omaha. This is one of the biggest mistakes I see made all the time from new Omaha players. So before you sit down and set up shop at an Omaha table, make sure you throw your Texas Hold'em theories and strategies out the window. Some common examples of players using Hold'em strategy in Omaha are when they shove all-in preflop with pocket aces or kings, when they bet top pair as if it's a premium hand, and when they try to force players with draws out of the hand. When you are playing Texas Hold'em poker, you want to only play good hands such as big pairs or big suited connectors. However, when you're playing Omaha you don't necessarily have to limit yourself to those hole cards. You will find that the majority of Omaha players will see a bunch of flops because they have lots of outs to make a quality hand. Don't be afraid to call pre-flop and never believe the hand is over until the river card is on the table. Omaha Mistake #3 - But They're "Soooted!" Too often you hear people justify their hole cards by explaining that they were suited. Yes, suited cards are better then unsuited cards, but just because your jack and your four are both hearts does not make this a strong hand. It is still a flat tire and a sad hand to play with. In the example above, the best flush you can make is Jack high, which is a mediocre hand at best in Omaha poker. One important piece of info to remember is that in Omaha, two suited cards in your hand are much better than four suited cards in your hand. With two suited cards, you have eleven potential cards to make your flush, but with four suited cards, you only have nine cards to make your flush. Learn more about Starting Hands in Omaha Poker. Omaha Mistake #4 - Bluff Much? Although in Texas Hold'em you may be able to use your position to bet others out of the pot, it usually doesn't work in Omaha. I know it seems repetitive, but with each player having four cards, everyone is going to have more draws, and thus be more likely to call your bets. If you're going to make a bluff your best shot is to do it on the river once everyone's hands are complete. Bluffing is even less worthwhile in Fixed Limit Omaha. Learn the differences between Pot and Fixed Limit Omaha. No matter what poker game you are playing, before you sit down at the table you need to put on your poker face. Poker is not a game of chance or luck, instead it is a game of odds and skills. Knowing how to read other players is a key skill when playing poker. Knowing how to mask your own face and tells is even more important. Don't look too happy or sad. Try to keep yourself at a calm medium mood at all times whether you have a royal flush or crap. You don't want them to be able to read what you have or how you play. Don't always bet the same, don't say the same things. Switch it up and keep them guessing at all times!